Building trust among your teens in a digital era can be more difficult that you think. 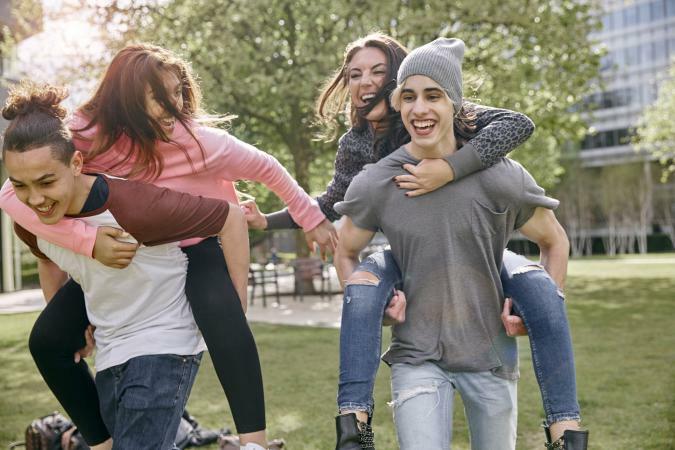 Using activities designed to make teens trust and communicate with one another can help youth groups, teams and just friends jump over this hurdle. Explore several original trust building activities for teenagers. Trust is all about communication and being able to believe and follow what your friends are saying. Take away your sight and add a rider on your back and this is doubly important. Help teens to build trust through this unknown obstacle course. Using the rope, create a lane. Choose who will be the walker, rider and obstacle thrower. The rider will get on the walkers back and quickly blindfold them. The obstacle thrower will say go. Staying about five to ten feet in front of the walker, the obstacle thrower will start throwing obstacles. The rider must tell the walker how to avoid the obstacles, using commands like go left, go right, step over, etc. The obstacle thrower must throw the obstacles slow enough to give the walker and rider time to react. After they make to the end of the lane, switch. Teens need to learn how to work together toward a common goal. This can be even more meaningful if the thing moving toward a common goal is something personal to you. Trust your friends to make sure that your precious item will never hit the ground. Line up the teens in a straight line facing forward. Only using verbal commands, the teens must pass the item all the way down the left side of the line and up the right side. Once they get good with one item, try it with two or try having one person step out and the others filling the gap. Continue until they have made it through all the items. While you might not realize it, trust comes from the eyes. The look or even shape of the pupil is used to decide if we want to trust or listen to a person. Build this skill by playing a trust activity that is all about the eyes. All you're going to need for this activity is a cone, space to move, and at least two teens. Oh, and don't forget the fun. Follow these steps to a laughing good time. Place a cone in a random area. Two teens need to face each other and link hands about 10 feet away from the cone. Now, the teen facing forward is going to work to guide the teen facing backward toward and around the cone. However, the teen can't talk. The teen can only use eye movements, facial gestures or head movements to guide their friend. Once they are successful, switch. Learn how to trust each other to get out of a tough situation. Now imagine doing this blindfolded. Trust your friends to get you out of a small hole in a human circle before time runs out. Select two teens. These will be the commander and the follower. The rest of the group should create a human circle around the other two. The teens in the circle will now create a hole in the circle. This hole will only be open for about 30 seconds. The commander must use verbal commands only to lead the follower out of the circle through the hole. Give the follower two tries before switching. If the pair is successful, they will pick the next pair to be trapped. Trust is pivotal in working together. Learn how to trust your friends and work toward a common goal with a big inflatable ball. Smiles and laughing are pretty much guaranteed. In addition to a large area and big inflatable exercise ball, you need about 10 teens to play this trust activity. Let the fun begin. Have all but one of the teens stand in a pretty tight circle. The other teen will be the caller. Place the ball in the center of the circle. The circle must work together to keep the ball moving on par with the caller. Once they get the hang of it, the caller should get faster. The calls should also get more complicated. For example, they might ask people to step out of the circle or swap positions will keeping the ball moving to the right or left. Allow everyone a chance to be the caller. 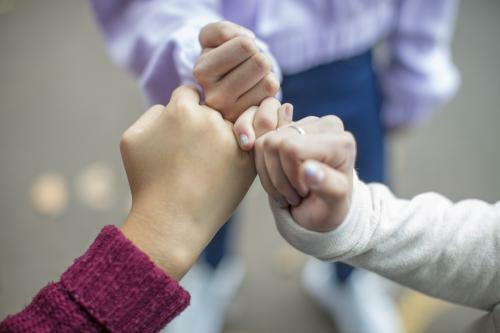 Trust is an important component of team-building activities for teens. Not only can this help to build bonds, but it can strengthen relationships and improve communication. Give one or all of these fun team activities a try, and remember it's all about having a good time.